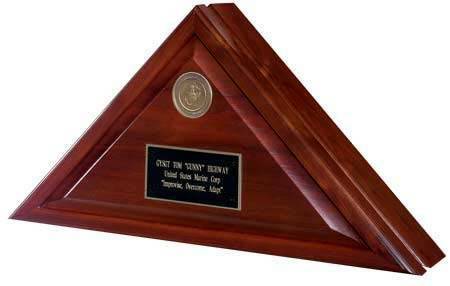 Memorial flag cases to display flags from retirements, funerals and other honored occasions. 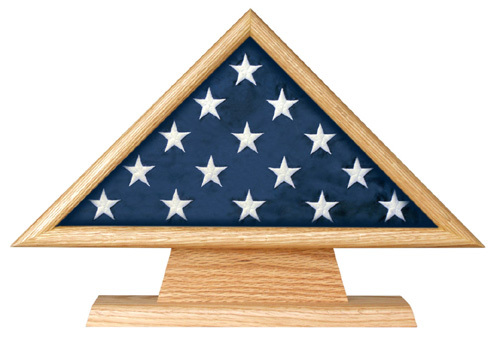 Sometimes called Triangle Flag Cases, Flag Holders, Veterans' Flag Cases or Funeral Flag Cases, their use is NOT limited for veterans or military retirements. 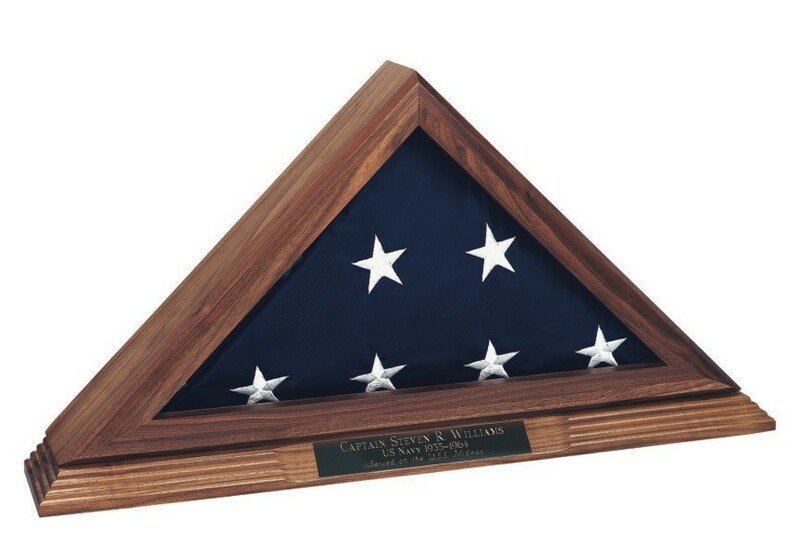 It is a myth that only flags for veterans may be displayed in flag cases. This is an honorable method to preserve and display a flag for anyone. Clear front, solid back for 5x9.5' casket flag. Very helpful for temporary storage or a simple display. Also a good way to keep your heirloom folded, clean and safe even if you are not displaying it. Plexiglass front. Plexiglass should be cleaned with a tiny amount of dish soap and water. Use a soft cotton cloth. Abrasive paper towels may scratch the surface. Do not use 409 or Windex cleaner. #NP2 $39.00 Black plate approx 1.25" x 7", (7/8" x 6" if supplied for the smaller #FB66 Lieutenant case), with three lines of gold lettering in the all capital letter type style as shown here; The engraving plate is SUPPLIED UNMOUNTED with double sided tape on the back and you mount it yourself. The engraving plate usually arrives in the mail separately from the flag display case. Don't be alarmed if they do not arrive the same day. When I saw how large the carton was and then lifted this flag case out of the packing material for the first time, I realized it was something very different. 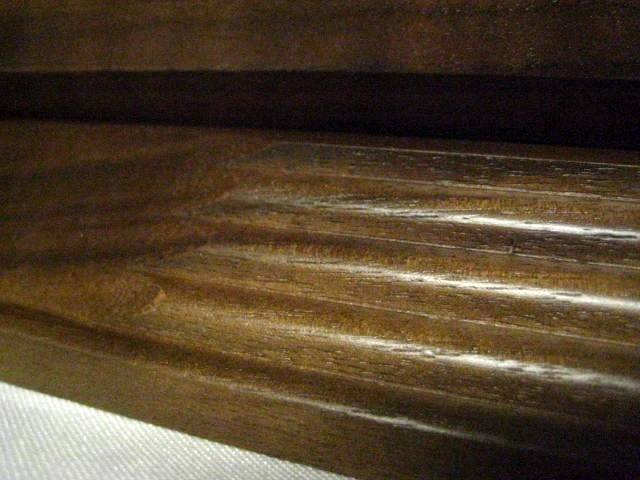 Even though I had seen the photograph here at your left and seen the measurements, it just had not registered with me how much solid black walnut wood and workmanship is in this case. It has so much detail, design, levels and contours, so much volume, size and weight that when I hefted it out of the carton for the first time, I understood in a way I could not have just from the photograph, that this is a very special flag display case. This flag display case is like a temple, it is like a structure, a shrine. "Maine Made" Triangular flag holder of pure materials and fine detail hand crafted in the great state of Maine by people who take pride in their work. They are also aware of the importance you hold in the treasured symbols you will display in their product. 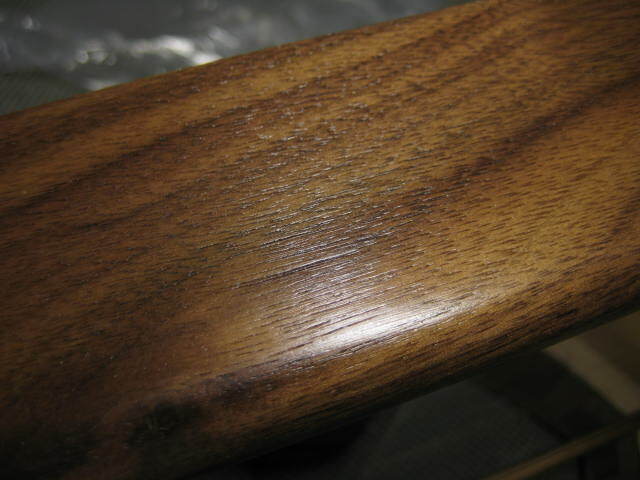 The case is finished with a high-gloss varnish that treats and protects the wood, ensuring a lasting luster. 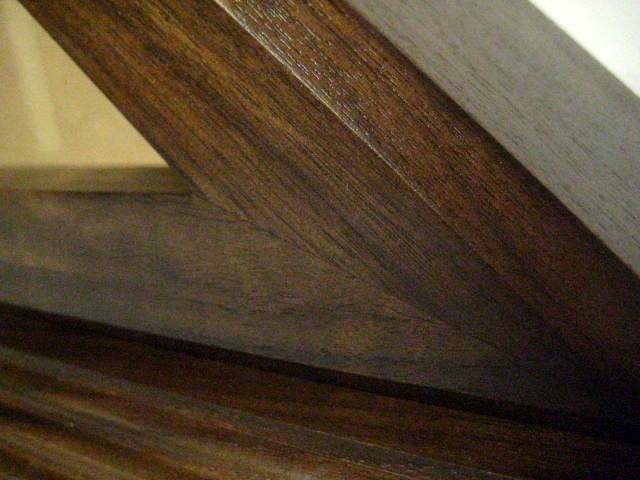 Flag frames come in many different grades; This is a fine furniture quality piece. CHECK YOUR SIZE. 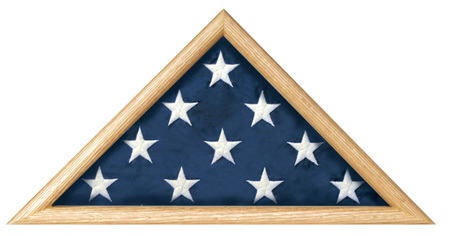 Most folks need a case for a 5x91/2' casket flag or a 3x5' ceremonial flag. CLICK TO ENLARGE. 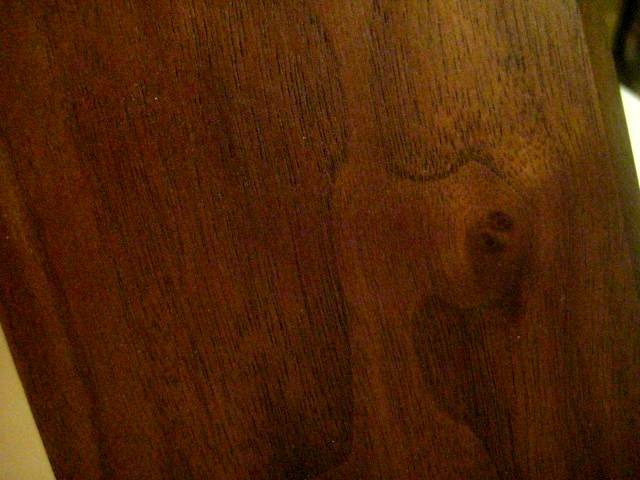 Also available in walnut. #507K $101.00 At last!!! For years you've been asking us for a case made for a 4x6' flag. This the only case we've ever seen made just for that somewhat in-between size size. 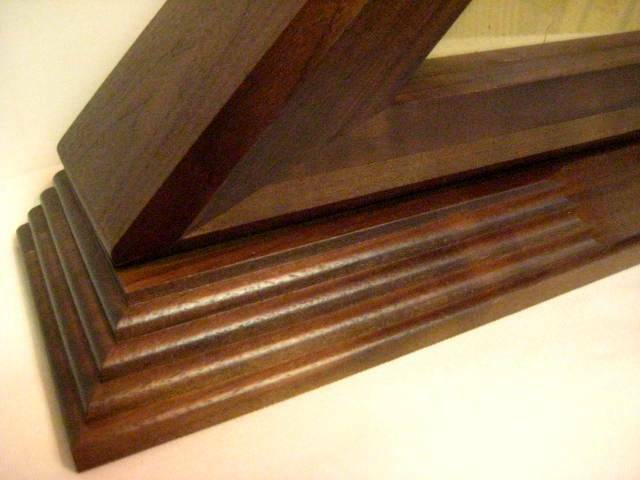 Fine Furniture Line Cases: There just are no more beautiful flag display cases. 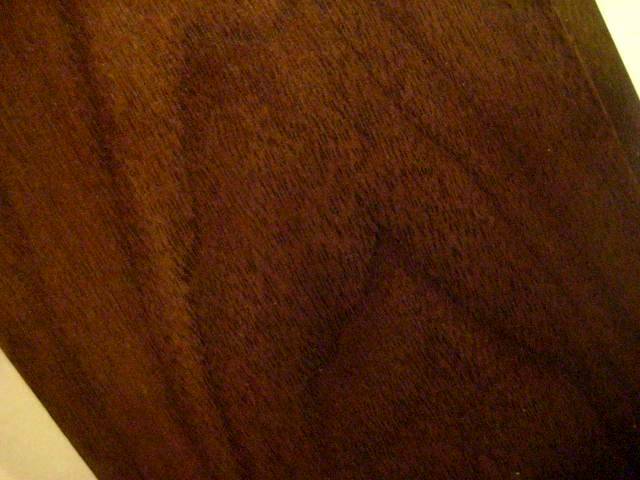 These are heirloom quality fine wood products made in the heart of fine furniture country in North Carolina, USA. Around here in New York, some people take vacation in North Carolina just to go down there and order their furniture from the shops that will make it. Twelve weeks later a truck shows up with your heirloom dining room table that your grand kids will one day have. These cases come from that same region and are made to that standard. Military flag cases from this product line are owned by United States Presidents. When you hold one of these cases in your hands, you will be struck by the care and the attention to detail those people put into their work. 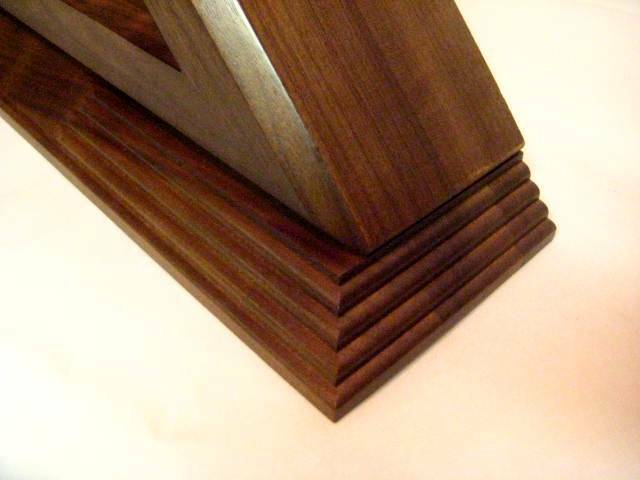 I have personally visited the woodshop were these wonderful products are made. They are the real deal. These are fine hand crafted solid wood cases made by folks who care in a deeply personal way about your happiness with their craft. They know that you are putting your most treasured keepsake in a case that they have made for you. If you can come to our shop, you will see that they look even nicer in person. I have not seen finer cases. For now, take it from me, these flag boxes look even better than these photos show. Black-on-brass engraving plate and engraving are available for an additional cost. 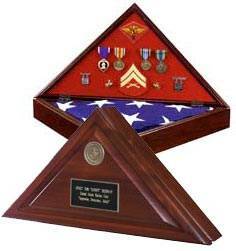 "The Veteran" Flag Display Case. Glass front and removable back panel with easy open turn-button closures. 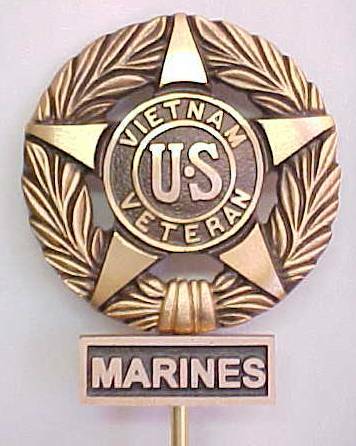 Brass service medallions: 2.5" Diameter. #BMZ Air Force, Great Seal, Navy, Army, Marine Corps, Coast Guard. 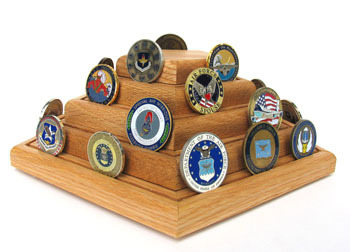 The Standard Pedestal includes your choice of these fine quality emblems. 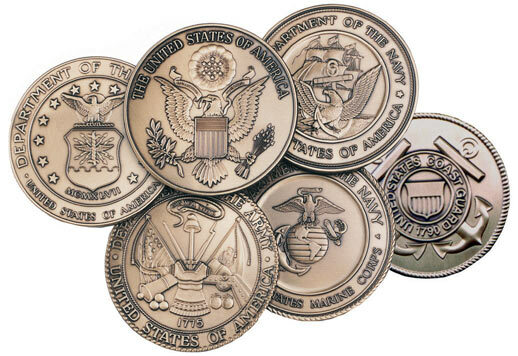 SERVICE MEDALLIONS MAY BE PURCHASED SEPARATELY FOR USE WITH YOUR OWN PROJECTS: #BZM $13.75 (Regularly 24.00 ea), Specify Air Force, Great Seal, Navy, Army, Marine Corps, or Coast Guard. THE CLEARANCE PRICE IS LIMITED TO THE STOCK ON HAND: Army and Navy are out of stock. Prices shown include an engraved black-on-brass engraving plate. MEDALLIONS AND ENGRAVING PLATES ARE SUPPLIED UNMOUNTED. They have double sided tape on the back and you mount them yourself. To assure accuracy please fax, mail or email engraving instructions. OD: 10" x 31/4" x 5"
The case opens from the front with a hinged lid and has a hidden magnetic closure and integrated dust seal to preserve your flag. A Velcro™ friendly insert to mount medals inside the back cover is included. The engraving plate and engraving are an additional cost. An engraving plate and engraving are an additional cost. Black-on-Brass Engraving Plate SUPPLIED UNMOUNTED. It has double sided tape on the back and you mount it yourself. The plate usually arrives in the mail separately from the flag display case. Don't be alarmed if they do not arrive the same day. To assure the accuracy of your valued inscription, we only handle engraving instructions in writing. Please mail or fax your engraving instructions. Check your work for spelling and punctuation. Use the specifications above and PRINT the lines of text. DON'T WRITE OUT YOUR ENGRAVING IN HANDWRITING THAT IS AS LIKELY AS BAD AS MINE!! Print it out. Better yet, type it. The factory engravers will use their own discretion and lay out your text "best way" using their experience and judgment. They will make it look very nice. See what I mean about fine furniture quality? CAREFUL: Know what size flag you have! 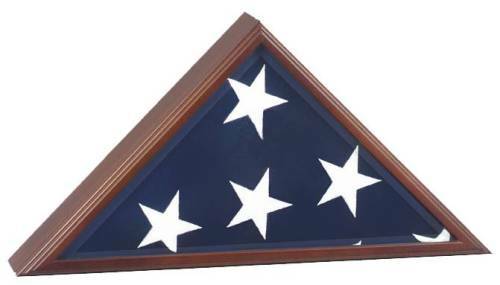 Large Flag Display Case: These are for flags from funerals which are are typically 5x9.5'. West Point!! We are just over the hill from that great little engineering school down the river. For decades we have been supplying flags used for retirement occasions there. Through the years we have been asked to supply many different sizes! If someone tells you to just ask us what size is supposed to be used there or what the "official size" is, please tell them we have supplied 2.5x4', 3x5', 4x6' and 5x9.5'. We supply what we are told. We have been told to supply all of those sizes. If the flag will be run up their main pole and flown for a day, please ask the MP's what size they want you go get.